I attended an Episcopal service this past Sunday (Palm Sunday). My rector spent much of the message talking about things both crucial and–at first glance–incidental to the season’s readings. She talked about racism. And hatred. She spoke about police shootings and bullies and Tamir Rice. And mostly, she described how our compassion dries up in the face of fear. It’s worth revisiting, especially here, in my community and others like it, where segregation and division build frightening walls between “us” and “them.” And it’s worth revisiting now, in this election cycle, when division makes headlines, spits venom, and influences votes. 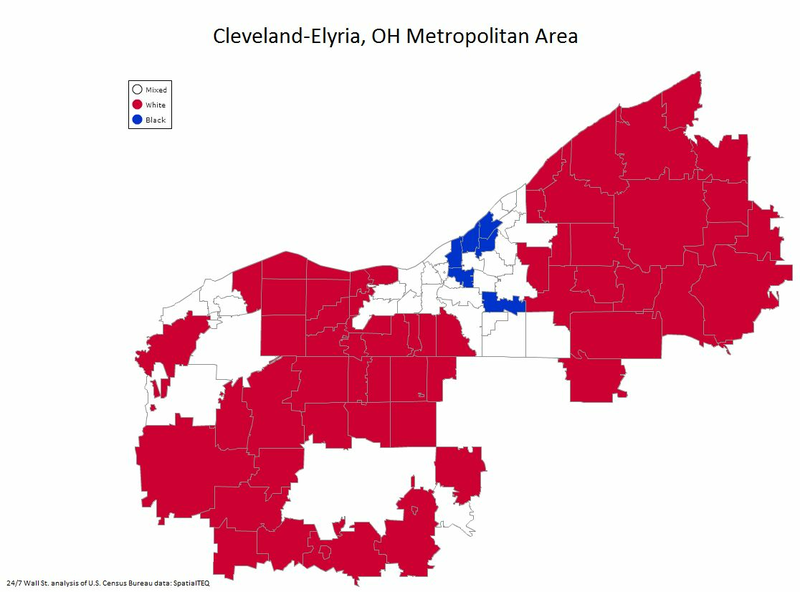 The US Department of Health still identifies Cuyahoga County as critically under-served. Statistically, that under-served population is made up of minority communities rendered invisible by segregated urban centers—what the Cleveland Foundation’s Greater University Circle Initiative (GUCI) calls the “invisible divide.” In an article by Alexander Kent & Thomas C. Frohlich earlier this year, Cleveland ranked as the number one more segregated urban area, with an equal disparity of income rates . Click to see the full image in Huffington Post. You need only look at the image to note the significance of that division. At the same time, this small minority community mobilized to swing a vote away from County Prosecutor McGinty (whom many faulted in the Tamir Rice case), sweeping these precincts for challenger O’Malley. Again, the picture tells the story. As Rich Exner’s article explains, O’Malley was supported by U.S. Rep. Marcia Fudge, a Warrensville Heights Democrat “who represents parts of Cleveland and eastern suburbs,” and “by prominent members of Cleveland clergy” who believe McGinty mishandled the prosecution of police officers in the death of 12-year-old Rice . What does this mean? I won’t use this example of voter mobilization to declare ‘good things come out of tragedy,’ though some may. And while it proves, on one hand, that minority populations can influence outcomes, it also continues to reinforce that same old racial divide (O’Malley won all 282 precincts estimated to have a majority black voting-age population, while incumbent Timothy J. McGinty still won in majority white areas ). Efforts have redoubled to close these health-race-income gaps, such as the Greater University Circle Initiative, which aims to build better connections between under-served communities and institutions. Additionally, Tom O’Brien runs a project called Neighborhood Connections, with monthly “Neighbor Up” meetings in the circle. But one of the principle themes has been a lingering sense among at-risk neighborhoods that even now, institutions have not done all they could to reach out. How we build trust in these communities, and how we aid in fostering dialog and growth, continues to be a major obstacle… for all of us. How do we foster compassion and trust? How do we drive out fear? How can we change the fact that, in this urban center and among leading cultural and medical institutions, we still have the most segregated city, with the greatest disparities of income and health (and one of the highest infant mortality rates)? It’s a medical humanities question because it is a human question; our health and well-being depends on it, on those willing to stand up in the face of wrong, or to stand in the gap and help to bridge it. We cannot do that in fear–we cannot do that and fear. The rector’s Palm Sunday message reminded me that the world surrounding a certain small band of Galileans likewise surged with racial divide, mistrust, tension, and threat from their own authorities and ‘peace keepers.’ And it reminded me, too, of our personal responsibilities. She ended with a call to action: when you feel tempted to shout “someone ought to do something,” be the someone and do the something. As historians, and health professionals, as sociologists and anthropologists, as students and teachers, as employees and business leaders, as neighbors, as friends–as human beings: let us stand against division. Let us unite in compassion and drive out fear. Let us tear down walls, instead of building them. Alexander Kent & Thomas C. Frohlich 24/7 Wall St. The 9 Most Segregated Cities In America. Huffington Post. Aug, 27, 2015. Rich Exner. Vote in black communities sweeps Michael O’Malley to victory over Cuyahoga County Prosecutor Timothy McGinty. Cleveland.com. March 17, 2016.